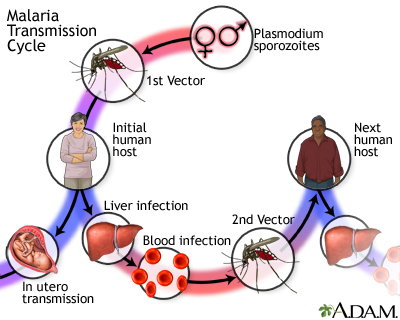 Malaria is caused by a parasite transmitted from one human to another via the bite of an infected Anopheles mosquito. The parasites migrate to the liver, mature and enter the bloodstream, where they rupture red blood cells. An infected pregnant woman can transmit malaria to her unborn child.